Aluminum siding prices range from $5 to $9 psf (per square foot) installed. Aluminum siding is a durable material that can provides several "looks" to a home - either a rural farm-like feel or a more modern and sleek look. It all depends on what materials are used with the siding to bring out the particular aesthetic. Explore additional house siding options. Expect lower end to mid range panels to cost $1 to $2 per square foot. Panels can be purchased by the homeowner at a home improvement store or through your contractor and are typically sold by the square in say 12 piece panel boxes. Expect mid to high end panels to cost $2 to $3 per square foot. Again, panels can be purchased by the homeowner at a home improvement store or through your contractor and are typically sold by the square in say 12 piece panel boxes. Within this category, we include the cost of nails, housewrap, trim pieces and soffits, mounting blocks, starting courses etc. See what additional siding materials cost. Within this category, we include the cost of nails, housewrap, trim pieces and soffits, mounting blocks, starting courses etc. This includes the cost to tear off the existing siding and install the aluminum siding, as well as wrapping the house and prepping the walls etc. 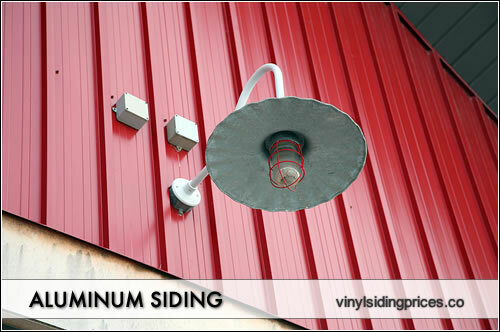 Aluminum siding is relatively easy to install, although it is about a $1 per foot to install than standard vinyl panels. Lower end to standard projects will range from $5 to $6.50 psf installed. This includes the aluminum panels, all additional materials and the cost of the installation. Standard to high end projects will range from $5 to $6.50 psf installed. This includes the aluminum panels, all additional materials and the cost of the installation.